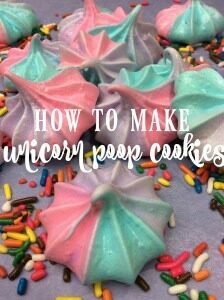 With the Starbucks Unicorn Frappuccino coming soon, these cookies would be the perfect partner! 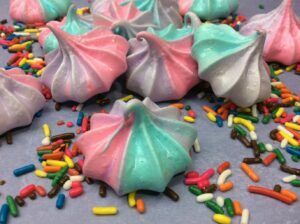 Meringue cookies are light, airy, and sweet because they are made with primarily whipped egg whites and sugar. They don’t contain flour, so they are a perfect sweet treat for those who are gluten-free eaters. Just make sure the food coloring does not contain any gluten. 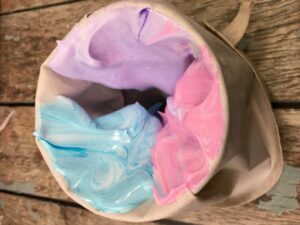 You can change up the colors for any special occasion–purple, pink, green, blue and more, the possibilities are endless! 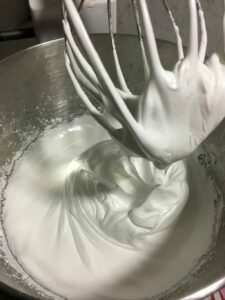 Add the sugar 1 tablespoon at a time first then add 1 tablespoon of powder sugar coating until all is combined. You will want to see stiff peaks form.